An updated head pack, containing more realistic heads for both men and women, and updated Hollow textures. Heavily modified, but based on textures supplied by FROM software with the core game. Please buy Dark Souls a hundred times so we have a million sequels. More realistic male and female heads. Male heads have less drastically chiselled look, more realistic bone structure, and refined specularity texture for less of the "sweaty" look. Female heads have much more feminine bone structure and subtle freckling on the nose and forehead. That's a fine ember you've got there! 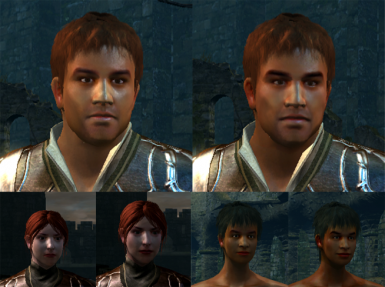 Andre's Cranial Ember updates the character heads for both male and female characters. This affects not only the player character, but NPCs as well! Textures are more subtly realistic and reduce the doll-like gaze and baby-face that the original characters had. Male characters are more rugged and chiseled. Female heads have more shape, but are softer than the male textures. Both genders contain custom diffuse, specular and normal maps. Custom eye textures are also included, which are higher resolution and have more realistic shadowing and glossiness. Also contains updated hollow textures, which are brighter, cleaner, and have reduced color.